After a short hiatus we're back with the quizzes, minus the Corker for now. Enjoy. Answers given one month after publication. A. What was discovered many moons ago in the basement of the St. Ann's Court tenement? B. When was the Bleachfield created? C. Where was Catchpole Close? D. Which former stated location for The Sandwell was incorrect and which is The Sandwell's true position? E. Who was the Wolf associated with Wolf's grave, a mid-19th century Mid-Links golf hole? A. What unusual commodities were a source of income for Dunbar Town Council in the mid-19th Century? a) Street dung and harbour mud. An annual rental, let by public roup, was charged for the collection of these items and in 1859 this produced an income of £130 10s, equivalent to around £16,000 in today’s money, so both items were clearly of great value at the time. B. When Joinery/Carpentry work was necessitated aboard Radio Scotland (242) in '65/'66, on the former lightship Comet, which company was contracted to do the necessary? a) MacArthurs of East Linton. C. Where did Dunbar Rugby Club and indeed Dunbar Hockey Club play their early fixtures? a) At the Paddock on Drysdale, of Castellau, ground at what is now Parsonspool. D. Who, apart from Charlie Gray & R Wight (whose effort may have been a draughted facsimile of the former) depicted, from a marine perspective, the three fisher cottages on Dunbar's Mid-Links at The Vaults? a) Berwick-born naval and marine artist Frank Watson Wood, (1862-1953). This art work is in the Archie Baird Collection. The Charlie Gray painting is in the late Eddie Gray’s front room. R Wight’s representation was with the Henderson family (who had long associations with Catcraig/Strand House and Vaults limestone and fishing industries), formerly of Summerfield Road, now of East Anglia, however, it is now with a cousin of the family, a Mrs S, who is a resident of the Green Hollow (Glasgow). E. Why was the story of Lochend House's conflagration, in 1859, being the 'product' of a gypsy curse patently untrue? a) Because the Cliveden Curse was invoked/pronounced on Cliveden House, the Warrenders’ other 1830's mansion in the Berkshire countryside. The present Cliveden House, the third on the "Chalk Cliff" site near the Chilterns in Berkshire, was designed in the 1850's by Sir Charles Barry. The two previous edifices were destroyed, in 1795 and 1849, by fire. Warrender's remodelling of the building, just into the 1st quarter of the 19th century, was carried out between the 2 blazes. A. What is the connection between James Hogg, the Ettrick Shepherd, and Dunbar? B. When did our Bleachfield become the Bleachingfield? a) In the first instance, probably during late Victorian times, following the example of romanticising of our country's heritage by Sir Walter Scott, and subsequently reinforced after the extensive acquisition of our Breezy Burgh’s Common Ground to build our erroneously named “Bleachingfield” Community Centre. C. Where might there be several postulated locations for St Bey's/Ann's "Chapel"? a) i) At the foot of School Brae. ii) Propinquous to St Ann's Court (which was situated roughly where Lamer Court is now). The most likely location. iii) At Winterfield (near Dun Rocks). iv) Surmounting the crag above Bayswell cave & beach. v) At the foot of Logan's Stairs on an earlier site of Logan (Dunollie)/Marine View, predating the former secessionist kirk. There is evidence of early Christian burial nearby at Clyde Villas. D. Which alternative names have been attributed to The Bamburgh or 'Ghostie' Close? a) Strachan's or Grant's (maybe even Turnbull’s or Bisset’s, at one time). E. Why and when was Dunbar Castle destroyed beyond reinstatement? a) The demolition was carried out in 1568, by order of a James VI Act of Parliament, as it was ”unprofitabill to the realme and not abill to defend the enemies thairof”. Also, it was “becumin sa ruinous that the samin sall all uterlie decay except thair be sic expenses maid thairupon as is unabill to be performit without greit inconveniences”. And so, the castle was destroyed after nearly seven hundred and seventy years of authenticated history. Thirteen years later the castle ruins and adjacent grounds were handed over to the Town. A. What was secreted behind the shelter on the wall, short of the Brig Burn on Dunbar Golf Course's 6th hole? a) A ha'penny, dated 1917 and one could definitely guess why! B. Where is the Dip pool? a) Across the once-shallow sand from the back wall of Seafield on the town's Middle Road. It is the large onshore dub with its own channel. C. Which Geological feature 'runs' beneath the present (and no doubt future) clubrooms of Dunbar Golf Club? a) The Southern Uplands fault, and its course is from Dunbar to Girvan. D Who, buried in Dunbar Parish Churchyard, in lair B340a, took part in the Charge of the Light Brigade at Balaclava in the Crimea, on 25th October 1854? a) Sergeant John Penn of the 17th Lancers. 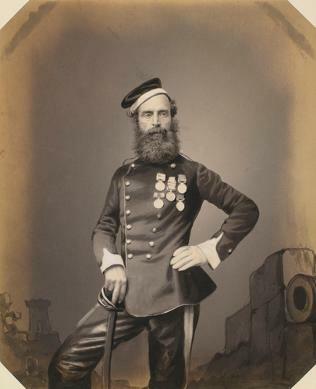 He was thirty three years old at the time and was known by his fellow lancers as “Old Jack Penn”, perhaps illustrating how young his comrades were. E. Why, supposedly, was Dunbar Railway Station guaranteed a yeoman service when the iron horse first travelled through the "Breezy Burgh" during the mid-1840s? a) The "Warrenders" permitted unfettered access through their lands of Underedge etc with the proviso that the town got a bespoke train service. A. What is the connection between the ground at Dunbar Golf Course as it was in the 19th century, onshore from the Wee Meaddies, through Maggie Tailor’s Garden as far as Bowe's Quarry, on what is now the 12th hole ('Point') to the NW and embracing 10th (part of), 11th and 13th holes of the current course, and the YouTube clip posted above? a) Rabbits. The Rabbit Warren in olden times embraced the acreage roughly detailed above and the mp3 track is Bright Eyes from the film Watership Down, adapted from the book by Richard Adams and which is sung by one of the co-songwriters, Mike Batt. Oddly enough there was another warren not far away, SE of Catcraig, NE of East Barns and just SE of Barns Ness, possibly at the end of Windmill Road. B. When was Knock-en-hair House built? C. Where was Dunbar's Cornbank? a) At what is the Category B listed house now called 'Barnlea', at 9 High Street. D. Which name is vaguely discernible on 'Croft House' on the town’s Delisle Street? a) (The) British Linen Bank. E. Why, when the Drysdales of Castellau (or should it be Castellaw) ferried their perambulator round our burgh, was there not a child within? a) Because their children had grown up and their Alsatian dog, struggling to walk, was their surrogate child. A. What is the connection between Gamelshiels Castle, a ruin near Spartleton Hill & Knock-en-hair? a) The lands around both at one time belonged to the Laird of Gamelshiels. B. Which hole on Dunbar's East Links Golf Course might be considered to be wrongly entitled? a) The 14th "Mill Stone Den". The "Den" in effect is of British Carboniferous Sandstone that is called Mill Stone Grit, quarried by Bowe (at Bowes Quarry) and is located geographically between Maggie Tailor's Garden and the Pierpoint, and named on OS Maps as Mill Stone Neuk. It is a few hundred yards away from the 14th, actually on the 12th hole i.e. "Point". Thus, the latter hole should be named Mill Stone Den or Neuk and not the 14th. C. Where on "The Breezy Burgh's" Lamer Street was called the Pairs' Hoose? a) The former "Model" House or Dreadnought, now renamed Cromwell Haven. D. Who was the Architect and whose house was being built at Abbeylands in 1910? a) John Jordan was the architect and the house was built for David Livingstone Bowe, not the quarryman, but a Potato Merchant possibly having farming connections. Additionally, "The Priory" is its name. E. Victoria Street used to be known as Dawell Brae sometimes corrupted to Darvell Brae. What is the origin of the name Dawell? a) Dawell Brae was an irregular street commencing at Lammermuir House and heading in a north east direction until it reached the Old Harbour. The name is derived from Jackdaw or, as it was once called in Dunbar, Daw and from there being at one time a well on this brae. A. What was the record number of tries scored by a Dunbar Grammar School player in one match? a) Between ten and fourteen (plus 4 or 5 conversions), by Charlie "Chuggy" Blacklock, in a match between Dunbar Grammar School's 2nd year team versus Liberton HS, in the Spring of '63 on the 2nd's pitch at Winterfield. There was a certain degree of disbelief and amazement amongst his fellow participants and therefore they lost count. Furthermore, the final score was 65-0. There is one abiding memory of CB kicking, in Garryowen style, from within his own 25 and sprinting like a greyhound then expertly catching the ball near the opposition's 25 yard line and running in to score yet again. B. When did a Dunbar/West Barns (ex-Tilton House Stables) trained horse last win a major race? a) Rockavon, owned by Strathaven farmer Thomas C Yuill, with 31year-old Norman Stirk aboard and trained by George Boyd, on April 26th 1961, surprisingly won the 2,000 guineas on the Rowley Mile Course at Newmarket. The 3 y/o bay colt won by 2 lengths, at odds of 66/1, from another 66/1 shot Prince Tudor with Irish challenger Time Grein 3rd and the 7/4 favourite 4th. Rockavon was the first Scottish "cuddy" to win a classic and its price of 66/1 still remains the largest odds for a 2,000 guineas winner. Rockavon was prepared for the race by one Tommy Craig, George Boyd's nephew and Tom travelled to the race at Headquarters with the horse and horsebox. The owner had a sizeable bet on the horse taking an ante-post price of 100/1. C. What and where was “Coltness”? a) This was part of an extensive limestone mine owned by the Coltness Iron Company Ltd from Lanarkshire and was situated south of the present Cement Works site and north of Easter and Meikle Pinkerton farms. It was part of the Oxwell Mains Limestone Workings, Catcraig Seam. The limestone was mined to provide raw materials to the company’s cement kilns at Newmains in Lanarkshire. The Coltness company operated the cement plant, and brick, concrete and general engineering businesses as a side-line to their main interests of steel and coal mining, and after steel and coal nationalisation, a rump company continued to run these peripheral concerns. D. Which bands was teenage drumming sensation Allan Pratt involved in, other than Jimmy Bain fronted and Dunbar's own, Nick and the Sinners? E. Why were the East Barns Limekiln Cottages called 'Tansy Bush'? a) Probably because one of the bushes/plants predominant in that area and abounding the original single dwelling-house was called Common Tansy, belonging to the Asteraceae (Aster) family. The name Tansy comes from a Greek word meaning immortality. People used to think that drinking a tansy infusion would lead them to eternal life. It reputedly has some medicinal value in small doses. The plant, which grows wild and has become invasive, is also called Weebo, north of the border. It has green foliage, relatively large, with yellow blossoms in season, and growth is profuse. It is not to be confused with either Tansy Ragwort or Wormwood which both belong to the same plant family and look very similar. A. What was the alternative name for the once-proud groyne emplaced around a century ago, between rocks on the southerly fringe of the East Beach, a few yards north of the man-made Woodbush gut (launching channel) and stretching out virtually to the LWMOST? a) The Brander. Its purpose was to maintain a certain level of sand on the town's main tourist attraction. (Its poorly designed and manufactured replacement lasted less than a generation). B. 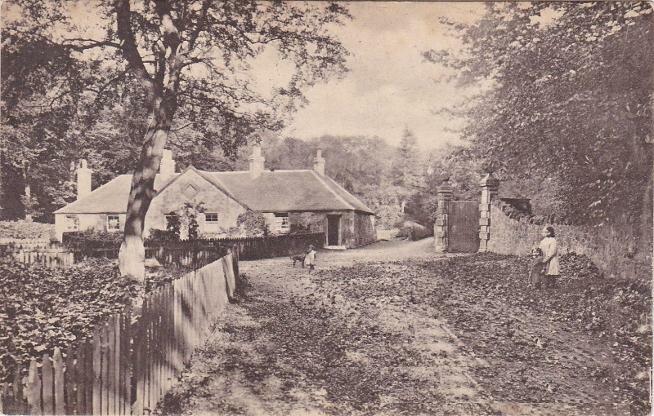 What is missing from the gate piers of the Lochend Estate's entry at Hallhill/Lochend Cottages? a) Both ball finials are absent. The southern one was last seen in public, floundering in a brooklet nearby and inscribed on this local treasure was the date in Roman numerals, MDCCCXXIII (1823), relating to when it was sculpted under the instructions of William Burn, architect, when the policies were re-fashioned, the boundaries enhanced and the Mansion House at Lochend recast. The northern finial was reputedly rehoused and is now believed to be in the hands of Dunbar Community Woodland Group, having previously been lodged in the historical archives of East Lothian Council. C. Which hole on the first Dunbar Golf Course plan ran from the present 8th tee, across the coastline parallel to the Pierpoint, to a green propinquous to the present 13th tee? a) The 6th hole named, perhaps anachronistically, “Wolf’s Grave”. Perhaps the creature had to be destroyed by the Warrenders, for scavenging in their nearby coney-yairds (rabbit warrens) however there is a Lawrie's Den on the far side of The Vowt Harbour. D. Who was offered and promptly declined the post of Assistant Headmaster under the aegis of J.N.Muir? E. Whose “brainwave” in the dark and distant early '50s, was to suggest to Hugh Cowan, Headmaster, that our school might be re-named Dunbar Grammar? We are pleased to advise that this is our centennial quiz, one hundred quizzes over a period of eight years and four months. Who would have thought there were so many interesting questions to be answered about Dunbar? In fact there are many more to come so watch this space. A. What was the name of the Buckinghamshire country mansion, originally by Villiers, acquired and rebuilt circa 1830 by Sir George Warrender? a) Cliveden, which was re-built between two fires under his aegis. Coincidentally around the same time, at the end of the 1820s, Warrender was having Lochend House “recast” on the site of a very much older building, under the instruction of one William Burn. B. When were the cottages/girnal and the attendant storehouse at “The Vaults”, on the links of what is now Dunbar Golf Club, built? C. Where are Dunbar's Wee and Big Meaddies? a) Offshore, and eastby and westby of the (once) Whitesands. The Wee Meaddies are the rocks offshore from the westerly half of Whitesands and the Big Meaddies are the easterly portion. They begin roughly east of where the drainage pipe of the Tarmac Cement Works filter beds disgorges into the sea. D. Which Dunbar street leads to what was once Dunbar Town's football ground? a) Spott Road. Dunbar Town's pitch, Laundry Park, was up the road virtually opposite the eastern entrance to what was once (and to true locals still is) “The Lovers Walk” (which became embraced into what is now Lochend Road by the early 70s), on the southwest side the railway bridge. i) Owner:- Mr J G Dingley. a) None of the above. 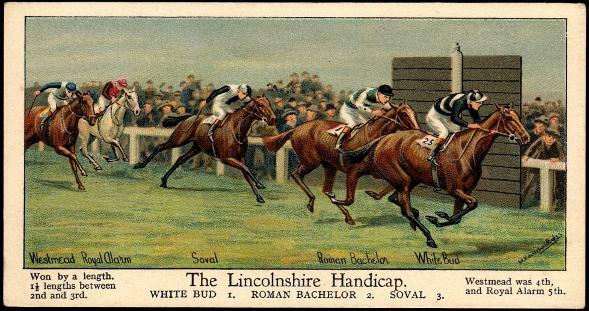 On the 21st of March 1923 filly White Bud (#25/30) won the 70th running (68th official) of the Lincolnshire Handicap (now the Lincoln Run, at Doncaster), a straight mile race. She was a 6 y/o carrying 6st 5lbs and her jockey was one John Beasley. White Bud came in at 66/1 and was victorious by a length from Roman Bachelor (100/8) with Soval at 50/1 a length-and-a-half further back. Royal Alarm and Westmead were contesting 4th close-in but Westmead came out on top. The Winter of '22/'23 was not an open one therefore “Old John” may have benefitted a bit by being able to work on his charges on our Belhaven Sands whilst other courses, gallops and yards were frost-bound and this could have added to White Bud's “credentials”. Nevertheless, the other “big” winner of the day was one John McDonald, a “Boots” at the Bellevue Hotel on Queens Road. Having heard “racing” connections in the Lounge Bar and, ignoring the quidnuncs, he overheard that the horse White Bud would be trying. This was enough for him; furthermore, he staked all he had -shirt excepted- on the filly winning and she duly delivered at “double double carpet”. With the substantial proceeds of his wager he was able to invest in the George Hotel on the town's High Street and the rest as they say is his history. A. What is an alternative name for "The Blue Rock", an erratic, now more propinquous to DGC 16th fairway than ever before, having been repositioned with a digger? a) The Ha'penny Bap. The Ha'penny Bap was moved 600yds into the foreshore by Thomson’s for APCM/DGC to protect further erosion of the 16th fairway and act in a way as a breakwater. There were also tons of boulders moved by a large JCB with Willie Fairbairn aboard. The Blue Rock was originally located aside the 2 large dubs in line with the Burn mouth. B. When was the photograph of Flooker's Great Grandson, pictured above, taken? a) Just after his 18th birthday, in March 1982 (The camera used was a gift). 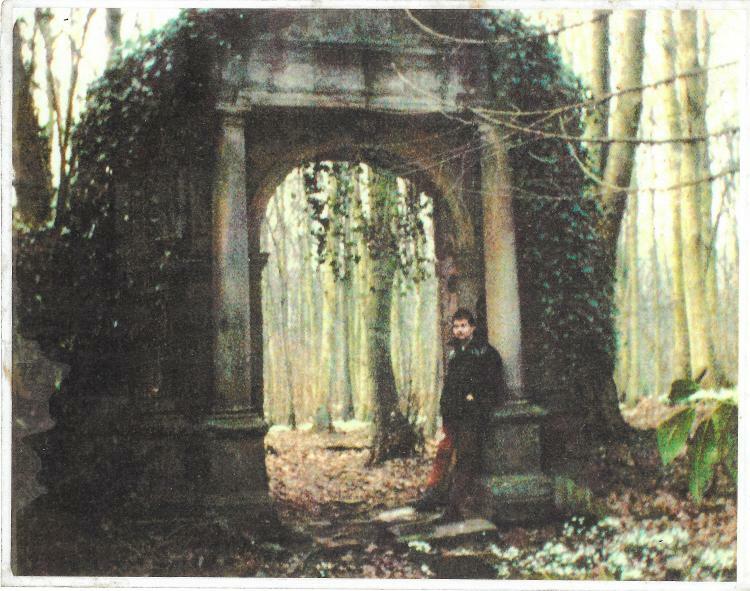 The location was at the now "disappeared" Lochend Arch. "Flooker" was Robert Turnbull (1876-1965) 2nd "husband" of Catherine Hastie. Dougie Turnbull, in the photo, is his great grandson and son of the late Jimmy Turnbull. C. Where were Bangor's Rocks? a) On the West Bank of the Biel Burn – The Dunbar Rocks were eastby. Eastby is on the Winterfield side as opposed to westby being on the Belhaven Bay/Beach side. D. Which one of the Beverley Sisters was married to a Dunbar dentist? a) James Mitchell married Babs in 1960. His practice (one of many) was at 17 High Street. He was married three times, his third, Ann-Marie, was the lady who nursed him back to health after his "accident" in the 70s. E. Who were Catherine Miller Mitchell's parents? a) William Miller (1788 - 6/6/1826) and Ann Whitehead (2/12/1792 - 14/11/1867). They were married at Spott on 26/09/1814 and Ann's parents were Alexander Whitehead & Christian Baxter, who were also married at Spott on 14/06/1782. Ann had two brothers, Alexander and Robert, and a sister, Catherine, therefore one can only assume "Kate" was named after her aunt. A. What was originally and traditionally stored at the Vaults, at three now demolished cottages, which were adjacent to the now tool/tractor shed at Dunbar Golf Course Mid-Links? a) Corn. The vaulted ceilings (hence the name) in the basement rooms of the cottages formed part of a girnel which afforded adequate storage space for grain, considering the denizens of the “Vowt” Cottages were 18 members of three branches (4, 5 and 9) of the Huntly family. i) The Countess "Black Agnes"? ii) The Countess of Lauderdale - Maitland family? a) Option ii) as the land about what is now the junctions of Lammermuir Crescent/Countess Road/ Summerfield Road and Doon Avenue, North of the railway, was acquired by Dunbar Town Council from the Warrender and Maitland Families. C. Where was Walter, the father of the Shipping Magnate Sir Walter Runciman, born? a) Irvine, Ayrshire in either 1805 or 1810. Walter was born on April 12th. His parents were Walter (1785 - 1854) and Marion, nee Runciman (1787 - 1810) who died at Innerwick. He was an only child but he had two half-sisters, Marion Frater and Elizabeth Fairbairn, plus a half-brother, his father having re-married one Elizabeth Slight (1806 - 1875). Walter's birth year is in doubt because one census and autobiography would indicate 1805 and another source, quoting a "Mariner's Ticket", states 1810. Another factor one has to take into account apropos the first decennial census of 1841, without bearing in mind the literacy of the populace, is that those enumerated were advised to round down their ages to the lower multiple of 10 e.g. 36=30. D. Who was the Headmaster at Dunbar Secondary School prior to Robert Macaulay (Years of service 1927-1953)? a) Andrew Comrie (Years of service 1897-1927). It is understood that there's now a street named after him at Newtonlees housing development in Dunbar. He was born in Forfarshire (now called Angus). He had a son, Alexander, who died in infancy and he himself died on 31/07/1939, aged 75. His first wife predeceased him and died (presumably in Dunbar) on 31/12/1904. He re-married one Isabella Storey. She died on the 13 June 1944, aged 77. They are all interred in Dunbar Parish Church cemetery in Lairs B82/3. E. Why was the building, listed in A. above as a tool/tractor shed, at one time called Mary Teetch's House? a) After the demolition of the three cottages and girnal at The Vaults, in the early 1920's, Mary Combe, known as Teetch because she was tiny, moved into the shed, lock, stock and barrel and lived inside this big building for a number of years. A. What is the only pre-Victorian Dunbar close with an ingress/egress to West Port? B. What were the dates of the two earliest gravestones in the Kirkyard? a) One for 1603 and one for 1604*. *This was a pseudo-Calvary cross, originally 13 feet long, divided into two, with both sections "planted" 10 feet apart and located c 150 yards West of the Kirk door. The southerly portion had a cross-member a couple of feet above the ground and the date 1604 near the base. Both parts would appear to have been removed c 2006. The earlier 1603 stone is 200 yards NW of the Kirk door. C. When was Dunbar's Methodist Divine, Thomas Rankin, christened? a) Son of Adam Rankin and Isobel (nee Purves), he was christened on 7th December 1735. D. Where is Dunbar's only "VC" buried? a) Sir Anthony Dickson Home is buried at Highgate Cemetery in London. E. Who was the only shopkeeper to have two sons who became professional golfers in the US of A?